Not suitable for use in the extremely cold weathers. Its use is limited to its temperature rating only. Are you thinking of taking your kids camping? Are you feeling undecided, because you are not assured of their comfort in the wild? Then you do not need to worry anymore. The Coleman 45 Degree Youth Sleeping Bag is a perfect match for your kids. As long as the temperatures do not fall below 45° F (7° C), this is the bag to buy. It serves children as young as six years old and remains comfortable for them even as they grow to heights of up to 5 ft 5 in (~165 cm). The bag has a design that glows in the dark, making it a lovely sleeping bag for kids who love stuff with cool designs. Their small personal items will also be safe in the inner pockets of the bag. 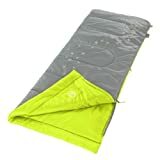 Given that kids may be a bit reckless on zips, the Coleman 45 Degree Youth Sleeping Bag provides a system that maintains the zip in order to prevent snagging. You can also squeeze a pillow into the bag as its backside stretches far enough for that. Additionally, you do not need to add a sleeping pad to this bag. It contains a lot of loft in it to keep your kids just fine. This sleeping bag comes with a 5-year limited warranty. Therefore, you do not have to worry about your investment as any manufacturing or workman defects can be taken care of within five years. Many inexperienced campers take their kids camping and bring their indoor sleeping bags together (those animal-shaped bags) and get their butts frozen. The Coleman 45 Degree Youth Sleeping Bag is a great bag for warm and mild nights. Your kids will love it not only because it is warm and comfy, but for its colorful looks and glow in the dark. If you have more than one kid, you can buy 2 or more bags which then can be zipped together – this way kids will have more fun.